A small west facing slope with a Northwest facing bowl at the southern end. Not a very good thermal or ridge lift slope and difficult to soar in light winds. Any thermal day can be overcome by sea-breezes in early afternoon. Unusable if the wind backs south of west. ACCESS From duty car park carry over the stiles to the west slope. RIGGING Hang gliders (H.G.) rig at top of the slope immediately to right of the top stile. Paragliders rig slightly down the slope – you will see the patch we use as it is well trodden. LANDING Top landing, particularly for H.G., is for experienced pilots only and will always be hazardous in fine weather due to the inevitable overcrowding of the site by the various users.Front face landings for H.G. need just the right height and approach from the southern end. Hill top (behind the fence line ) landings suffer a particular hazard from kite flyers, and H.G. require a minimum of 200 ft. setting up the approach from the southern end over the kiosk, beware of rotor in the last 30 ft. from the tree line and Rake Bottom (stay well over to the crest). NEVER FLY INTO RAKE BOTTOM, turbulence is extreme. Main bottom landing fields are immediately below take off in the bottom of the bowl and all are quite demanding for H.G. Field B1 slopes up towards the southern fence approach from the north and avoid running on into the valley. Field B2 falls away to the west. Retrieval, from field B1 is by car down Harvesting Lane. 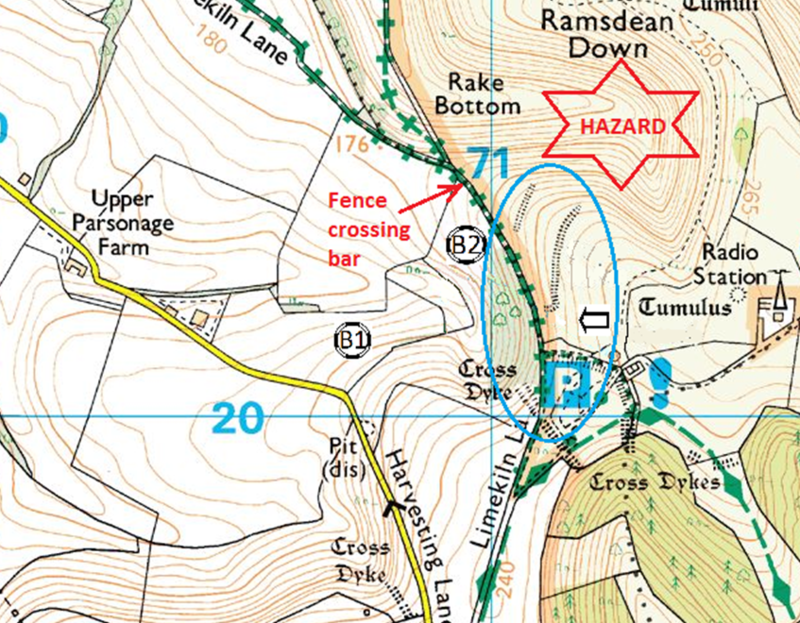 An “escape” landing B2 area is for paragliders only.Retrieval from here is over the fence at the climbing bar in the northeast corner then up the path and back to takeoff over the stile. HAZARDS Include walkers on designated footpaths, aircraft modellers generally grouped to the northern edge of the slope and their models overshooting kite flyers and parked cars in the top area, paragliders in circuit on the slope and gliders lining up to launch.Horse riders on the track below take-off may be hidden from view. Pilots in the air should fly away from the riders and shout to warn those pilots waiting at take off.Turbulence, from Rake Bottom can be extreme in all conditions and also from the tree line to the south of take-off when conditions are strong and the wind swings slightly to the south. If winds are south of west treat the southern bowl with great caution as you will be in rotor! Cars are NOT to be taken into the bottom landing fields. CONSIDER This is an extremely small and congested slope. Avoid mixing paragliders and hang gliders in the air at the same time. Try to alternate usage, if necessary by use of the half hour rule. 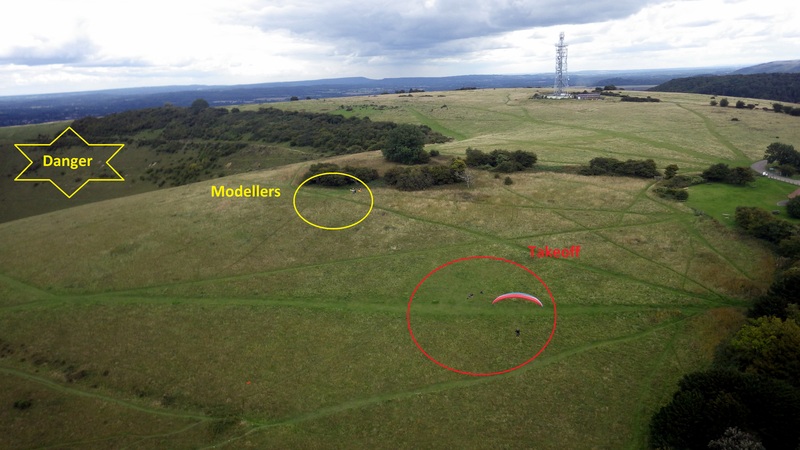 Aeromodellers favour the north of the slope, avoid overflying or inflating canopies in front of them. 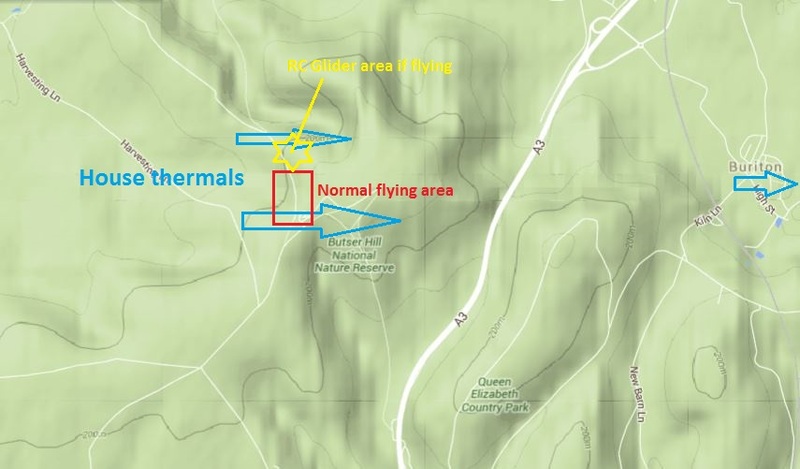 DO NOT infringe the modellers airspace (MVSA ) when at a height of less than 150ft ATO and preferably not at all unless well away from the hill. SET your vario to QFE!! The MVSA have accepted that at times when conditions are minimal, paragliders will need to fly in low from the South just above hedge height to land which requires entering the MVSA airspace. This is to avoid a bottom landing and walk up. If you do land in the MVSA airspace then gather the canopy and walk back to the launch area DO NOT pop canopy up or launch from there or attempt to soar!! When conditions ARE minimal is usually only safe for ONE pilot to be in the air at a time. Any problems are best dealt with at the time and it is advised to have a chat with modellers as a matter of course. 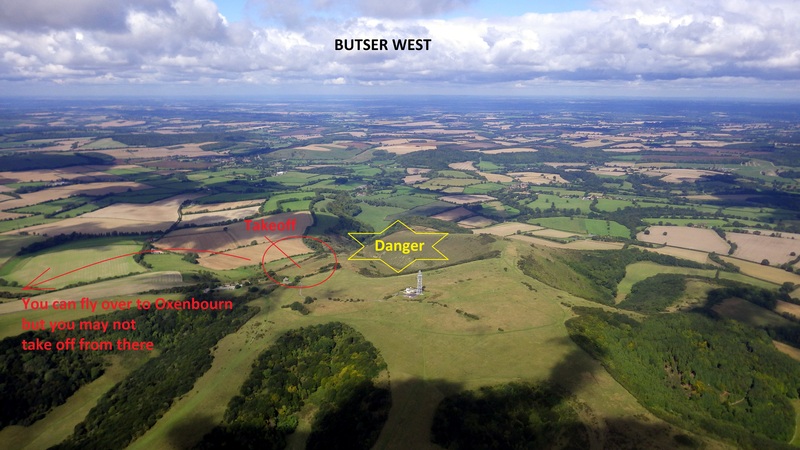 Butser West is harder to get away from, but is our best XC site in terms of downwind distance. You have to be very committed to get away from Butser West. There are very few opportunities to get high before making the decision to go back over the hill. The typical climb-out starts not much above take-off where you hook into a thermal, which then you have to stay with as you climb out up and over the back of the hill. Typically you will find yourself north or south of the mast depending on which one of the house thermals you hooked into. If the wind is a bit off to the north, you will normally be climbing out from above the bowl to the south of take-off. If more west, you could be to the north of the mast. One really interesting technique that has been used here if the wind is due west, is to get a few hundred feet climbing over Grandfathers Bottom, then once clear of the hill you can glide out over the valley, where thermals can be picked up above Buriton. IMPORTANT NOTE: the modellers use the north part of the slope and if they are flying that is basically off limits to us. This makes the northernmost thermal less useful. You are very unlikely to be doing your first XC’s from here, but if you do head down the ridge and follow the wind. You will hit airspace just before Harting but it is quite high at 4500ft. 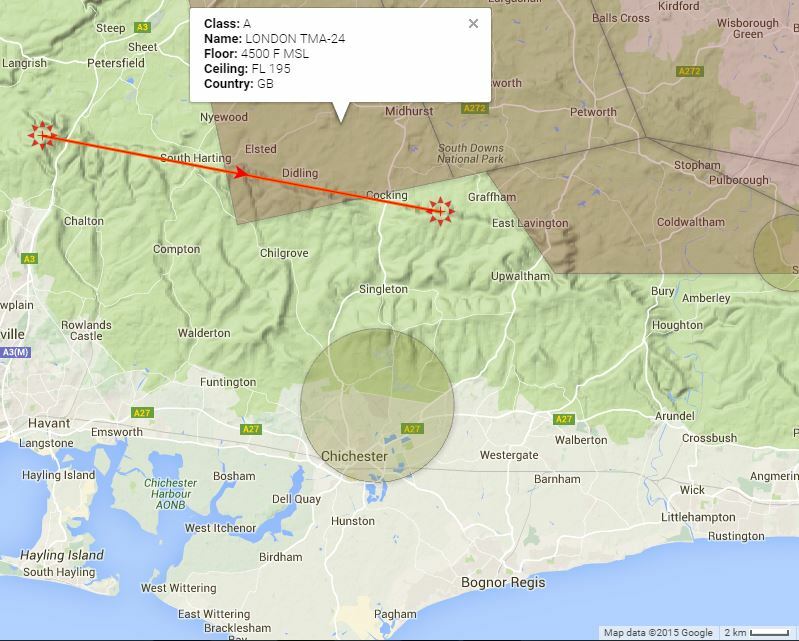 The other big consideration is Goodwood ATZ if the wind is off to the North a bit. Neither of these should pose a problem for the inexperienced XC pilot. 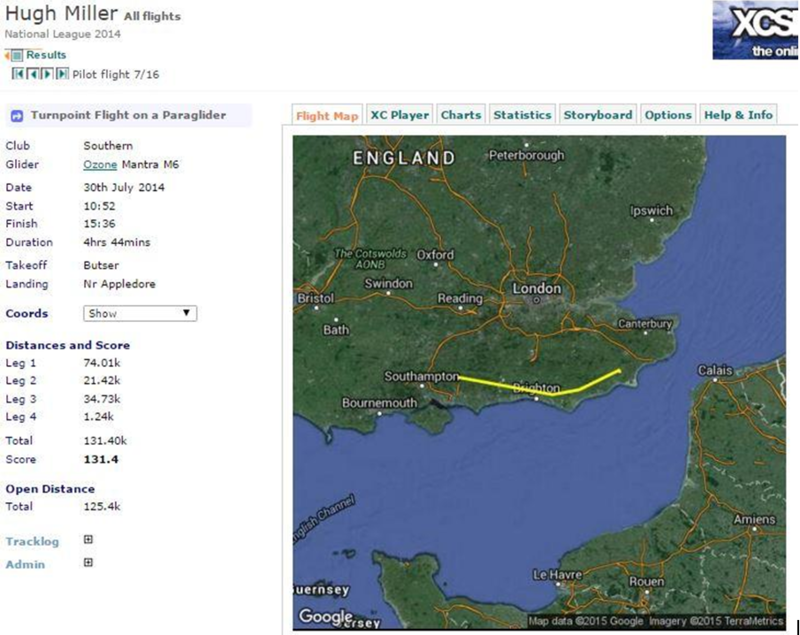 The trick to a long flight is to keep south of airspace and head for Devils Dyke and Brighton. Once there you can head more Northerly up into Kent and may be able to utilise the sea breeze front.